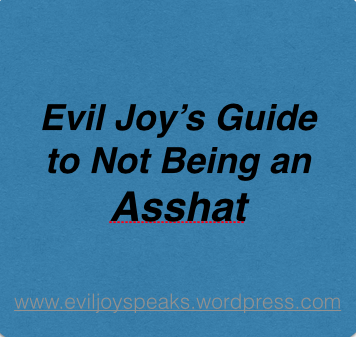 Instruction Guide to Not Being an Asshat…..
I’m borrowing a word from my friend and favorite blogger Snarkfest….Asshat. Today’s post was inspired by … cell phones … and the asshatery people pull while using their cell phones. If you are being waited on at a store, talk to the cashier, not your cell phone. Otherwise, you’re being an Asshat. If you are walking down a store isle that is full of people, look up from your device. Otherwise when you crash into the lady with a newborn baby, you’re being an Asshat. If you are driving in a school parking lot during drop off or pick up time, GET OFF YOUR PHONE. DO NOT CHECK YOUR EMAIL. Drive. Otherwise…you’re not being an Asshat….You Are An Asshat. If you are in a restaurant and you need to take a call, do it. However if you need carry on a conversation at the top of your lungs for a long time, step outside. Otherwise, you’re being an Asshat. If someone makes a mistake filling the order you’re placing while you’re talking on your cell phone remember those around you can hear all you’re saying. You may not want to insult the person filling your order to the person you’re talking to on your phone. If you do, you’re being an Asshat. And there are lots of witnesses. If you are unable to talk to a person uninterrupted by your cell phone, you need to change. Otherwise, you’re being an Asshat. If you talk with your hands when you’re excited, don’t get excited while talking on the phone and driving. Otherwise, you’re being an Asshat…and you may die. If you’re at your kid’s concert/sporting event/school conference put away your device and listen (after the few million required pictures of course). Otherwise, you’re being an Asshat. If your kid can’t function without a device to occupy them every second of every day, teach them to. Make them. Otherwise you’re raising someone who could become an Asshat. And finally……USE COMMON SENSE! Otherwise, you’re being an Asshat. This public service message to Avoid Becoming an Asshat was inspired by stupid people in Sam’s Club. Now…onto to better things. Today is Sunday. I typically don’t post on Sunday because it seems many of you don’t read on Sunday. SO….feel free to read it on Monday or any other day of the week. And share. Because sharing is caring. Facebook isn’t showing many people my posts anymore so I’m trying to reach as many of you as I can here on my blog, on instagram (@eviljoyspeaks) and on twitter (@eviljoyspeaks). Feel free to share my posts, statuses, and pictures! I love seeing what you all have to say and will do my best to respond!!!! Have a fabulous, fun-filled, Asshat-free day! EJ out – to soak up the 40 degree temps and clean a garage and about a shite ton of dog…shite out of my yard! Smell ya later! So…after driving to Iowa and back in a short span of time and my iPhone being dead (you know you have to pack a charger if in fact you want a charger in Iowa), Eldest Female Spawn and I listened to the radio A LOT. Evil A lot. I love country music, actually…I love most all music – U2, Rush, Dixie Chicks, Sugarland, Lady Antebellum….I don’t know..pretty much everything. However, the radio stations between here and there …and there and here really like the .. oh … about… the same EVIL 5 SONGS. Over and over and over and over and over. Now, a week or so ago, my friend’s daughter asked her the same question and I laughed. Now…I realize….entire generations of Spawn will grow up unaware of life without cell phones, DVD and Blu-Rays, Netflix, and the internet. There’s something to be said for advancement. There’s also something to be said for simpler times. Hence, my one (Evil) day a week of no screen time in my lair. Evil is in “( )” because my Spawn think it’s Evil – I think it’s awesome. They have to use their brains and speaking skills. The Evil Speaking Skills….sometimes the Evil Speaking Skills truly utilize the Evil Part with snarky words. Other times, the Evil Speaking Skills are wonderful and I hear plays being dreamed up and acted out. Evil Advances – Keep on Advancing. Keep on finding new solutions. Evil Joy – Keep on making life more simple. Choose which Evil Advances to embrace and which ones to ban….or at least resist. Evil Joy out – to unplug my children for the day and make them help me clean the house.